Last edited by 10ringo10 on Mon Nov 04, 2013 9:33 pm, edited 1 time in total. were you impressioning it Ringo? ARF-GEF wrote: were you impressioning it Ringo? I tried for a good few hours and no luck at all to impression this beast ! Are you sure it's the correct key for the lock? If not, I wonder if the previous owner used the wrong key on the lock, tried a bit TOO hard to turn it, and broke off the key and thats why your copy didn't work. I Have not come across the abus 90/50 pad lock before ..so did a bit of searching and on this stainless steel abus the core can not be removed ! There are other abus 90/50 that the core can be removed on.... and yes mbi you are correct it is not the correct key ! I agree impressioning is the way to go. Get some help by analyzing the picked pins height and make a quick drawing of the bittings if you wish. Then slowly impression it. That made me laugh. Thank you for thinking outside the box and giving us a more refreshing perspective. I guess a more apt description of a "lock that can be disassembled" could be something more like "a lock that is designed to be serviced via disassembly and reassembly." 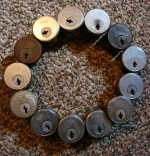 pick this lock and while the plug is turned, take a diamond pick and ride it up and down over the pins, watch the shaft of the diamond pick and see if the bumping along the pins corresponds to what you see on the broken key, and deep or high pins will be easy to learn the positions of. if the bumping diamond pick riding along the pins that are stopped by the cylinder wall, corresponds to the broken key, it may be that the broken key is a bad copy that is near the true bitting but just does not fit. a bad fitting key that works this way is cut too high, a key that is cut just a bit low, will not open the lock until you lift the key in the keyway or withdraw it until the pins climb a bit on the peaks and the key sort of picks it open.